Having met Joel and Julie Bates in Dublin on previous filming project, some years later they invited us to come to DM and shoot and produce a promo film to announce a new program being implemented, Equipping For The Journey. 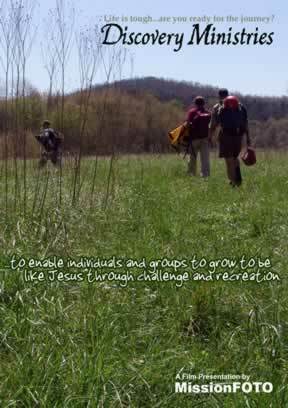 DM’s mission is to provide outdoor opportunities for teams to tackle challenging trips in the rugged and beautiful terrain of southeastern Missouri as they prepare to leave for the mission fields of the World. MissionFOTO trekked along with a team for a week of demanding mountain climbing, canoeing, caving and hiking as we filmed the action. Valerie had no problems with the 90 foot rock face repel. When they hung me 15 feet down below the edge to “capture the excitement”, I did have several questions that came to mind. Thanks to Joel, Jeremy and Joanna for bringing us safely back to the DM campus at the end of the adventure.